To remove ambiguity in written work and research, all relevant variables must be defined. This is known as operationalizing variables. To operationalize a variable or concept means to define it so that it can be measured and/or expressed quantitatively or qualitatively. When approaching any written assessment, it is important to demonstrate that you are clear about the assessment task and the purpose of writing. This can be assisted through unpacking the question: (1) identifying the actions you must undertake (e.g. discuss, select, compare), (2) dividing the task into its constituent elements (e.g. reasons for X, reasons for Y, alternative procedures), and (3) operationalizing your variables. It is this last procedure that will be discussed here. When planning any written work, it is important to consider how much shared knowledge one can legitimately assume exists between the author and the reader(s). For example, if I say that “the child failed the cloze procedure,” would you understand what I mean?1 If you are a teacher – and perhaps more especially a teacher of reading – then you will likely know what this refers to. However, you may not know what a cloze procedure is. If you can safely assume that your readership will understand this concept, then it probably requires little in the way of explanation. However, where there is any doubt or where greater specificity is necessary for readers to understand your argument, an explanation/definition must be provided in order to remove any potential ambiguities. These definitions are referred to as operationalizations and the process of creating them is known as operationalizing the variables. A hearing loss greater than 55 dB. Shouting and loud noise, such as traffic, can be heard but conversational speech cannot be heard. Some variables appear to be less complicated than others. For example, weight can be measured using the conventional unit of kilograms; height can be measured in meters. Other variables are not so simple. For example, how would you measure/define motivation? By the number of social clubs someone attends? By the number of times a person carries out physical exercise each week? The answers to questions such as this are not easy but it does highlight the need to be as specific as possible when operationalizing variables. We have seen that it is legitimate not to explicitly define certain basic concepts if one can assume that the readership of your paper has a good background in the subject area. However, do be careful, as some concepts may seem transparent but with more careful consideration these too can often be seen to cause confusion unless specifically defined. For example, if I talk about a child’s speech as being delayed, what do I mean? Am I just referring to the child’s so-called phonetic inventory (i.e. all the speech sounds in the child’s language that the child can articulate in-line with the accepted adult pronunciation) or to the child’s phonological system (i.e. the methodical rules that the child employs when combining speech sounds in order to speak his or her particular language)? It may be necessary, therefore, to indicate to the reader what you mean by speech – just phonetics, just phonology or both? The task is to be as specific as necessary to support your arguments and conclusions. 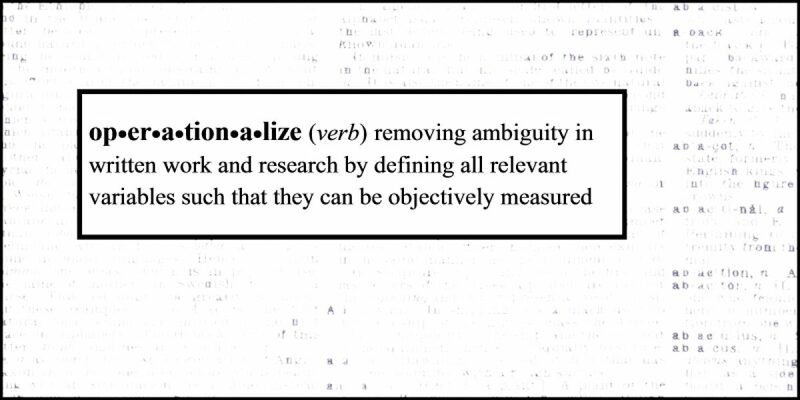 Operationalize: To define a concept or variable so that it can be measured and/or expressed quantitatively or qualitatively. Operationalization: The process of putting something into operation; also, the process of expressing something in operational terms. Whilst this article has focused on the need to operationalize variables within written assessments and reports, the need to operationalize is especially important when conducting research. Typically, the research methodology is optimized so that as many extraneous variables as possible are controlled. In this way, any changes in the behavior of the research subjects (or other object of concern) can be assumed to have been brought about by the researcher’s manipulation of the situation and not because of any extraneous, interfering variables whose effects have not been controlled properly. In order to improve the validity of any measures we make, we must clearly operationalize the variables that are of concern.